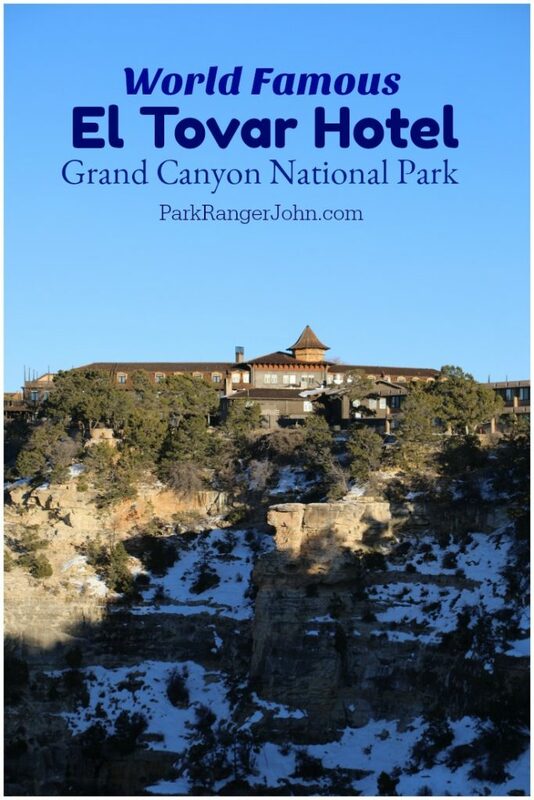 The El Tovar Hotel Grand Canyon opened on January 14, 1905, four years after construction started. It was named El Tovar in honor of Spanish explorer Pedro de Tobar, who had led the first expedition to Hopi Indian country in 1540. 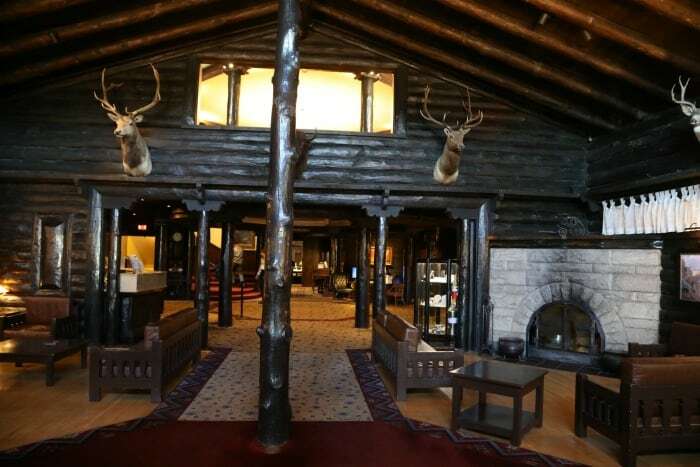 The Sante Fe Railroad reaching the Grand Canyon was the catalyst to building this great National park lodge. 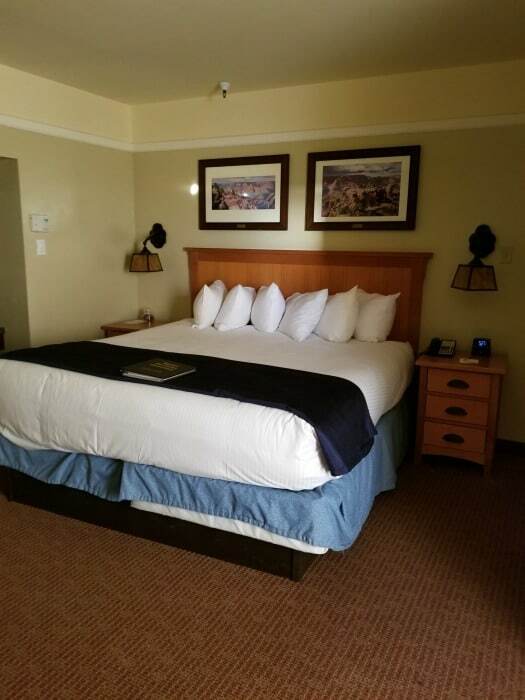 Our king room in the El Tovar Hotel at the Grand Canyon was located on the 1st floor near the rim of the Grand Canyon. Our room had a comfortable king size bed, writing desk, television with a wide range of channels, two comfortable chairs and table along with the en-suite bathroom with a bathtub/shower, sink and toilet. The bathroom has Xanterra El Tovar bath products including soap, lotion, shampoo and conditioner that are nicely scented. 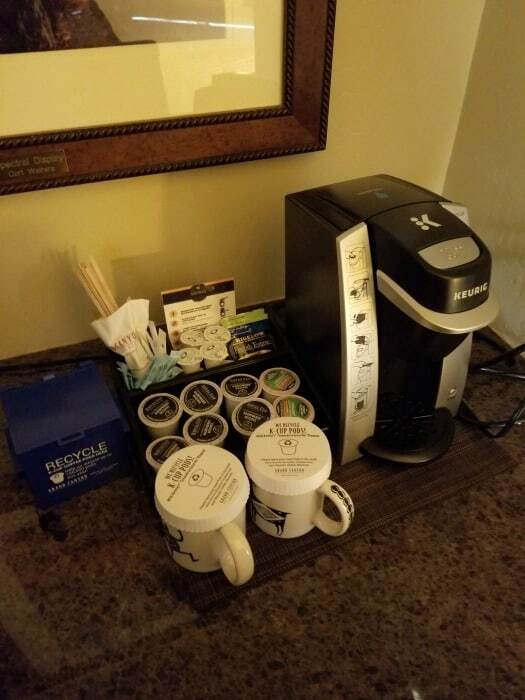 The room also has a Keurig with two coffee cups and a variety of coffees available. There are also a few tea bags in case you are not a fan of coffee. We really enjoyed our king room at the El Tovar. Our room was located on the first floor right near the canyon rim doorway. We could see the Grand Canyon if we looked out the window and turned our head a bit. It was not a straight on view but it was still absolutely amazing. The bed was really comfortable and there are a ton of pillows on it. Our favorite part was having the Keurig in the room and being able to enjoy a hot cup of coffee while relaxing in the two chairs near the window. This was such a relaxing way to start the day and plan where we wanted to go and what we planned to do. In-room amenities include satellite TV, in-room Keurig coffee maker, safe, telephone, hairdryer, full bath, and air conditioning. There were two robes in the closet along with an iron and ironing board. The parking lot is shared with the Hopi House and the Verkamp’s visitor center. You may have to circle a few times to get a parking spot. There is a space to pull up in front of the El Tovar and drop your luggage so one person can stay with the luggage while the other person parks. This made it a lot easier to get our luggage into the hotel and not have to drag it through the parking lot. There is also parking along the road but you will need to walk uphill to get to the hotel. Room service is available for breakfast and dinner only. The current menu can be found in the visitor services binder in the room. Wi-Fi is available in the room but may be spotty. Due to the remote location, the wi-fi may only support one device per room. We were able to connect to the internet but it was not fast. Definitely, don’t plan to download any large files or even upload a ton of photos. We could get emails to load and check Facebook but it took a bit. We did have service with T-Mobile on our phones. The signal was not super strong but enough for emails to come through and to post an update on social media. There is only a couple of easily accessible electrical plug-ins in the room. We had to unplug a lamp and the Keurig to charge our camera batteries and phones. You may want to pack an electrical bar or we use this electrical extension to have USB Plug-Ins. El Tovar does offer accessible rooms. To see available ADA-compliant rooms check the “ADA/Accessible Rooms” box in the online reservations application or call Central Reservations (7 am – 7 pm MT) at (888) 297-2757. A majority of El Tovar menu ingredients are locally sourced, sustainable or organic. 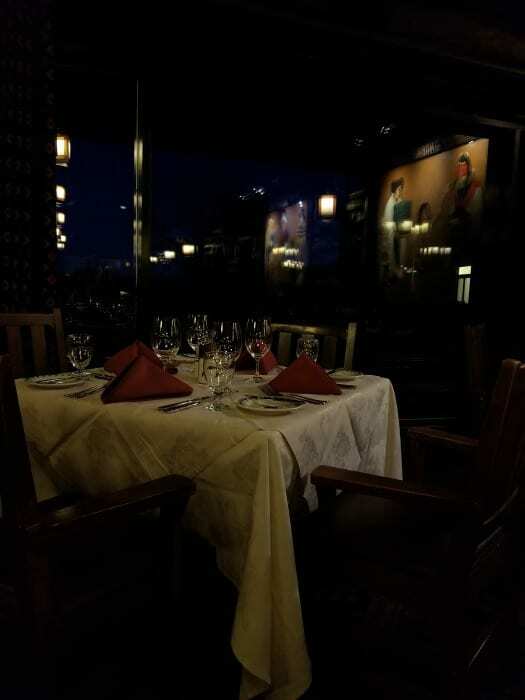 We enjoyed an amazing dinner at the El Tovar Dining Room after checking into our room. The food was beyond delicious and the atmosphere truly breathtaking. How can you go wrong when you can watch sunset changing the colors of the Grand Canyon from your dinner table. The service is on par with a 5-star restaurant. 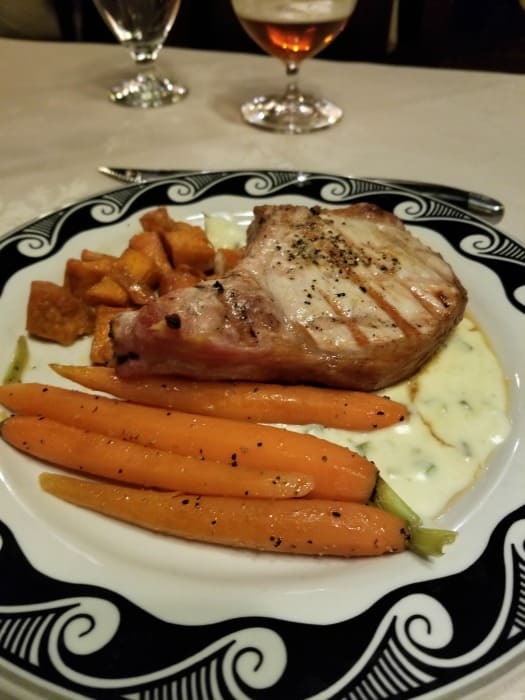 I enjoyed the 10 oz bone-in pork chop that had a jalapeno cream sauce along with carrots and sweet potatoes. I am normally not a huge pork chop fan but this may have been the best one I have ever had. Make sure and save room for the apple pie! The cinnamon strudel topping was the perfect pairing to the apples. 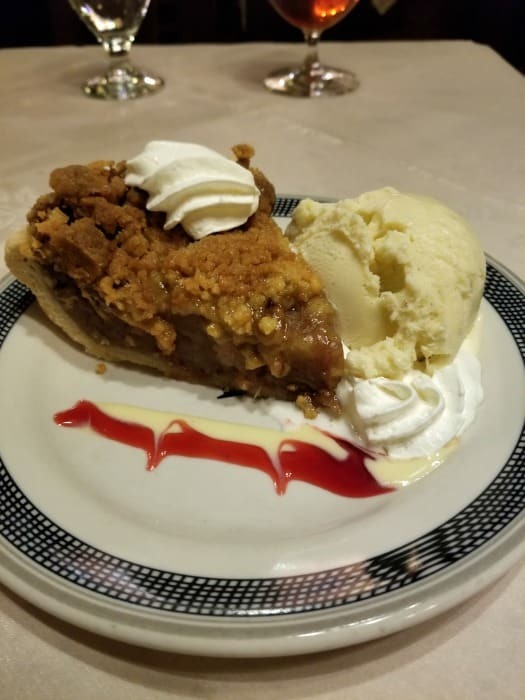 I had it with vanilla ice cream and could have easily skipped the ice cream and just enjoyed the pie. My wife had a cranberry orange creme brulee that was delicious. Our meal with tip cost $145 which included 2 beers, a prickly pear margarita, cheese and charcuterie platter, bone-in pork chop and pasta along with 2 deserts. The restaurant asks that you do not wear sneakers or flip-flops and dress for a nice dinner. Jackets are not required but a button-down shirt will not stand out as too dressy. 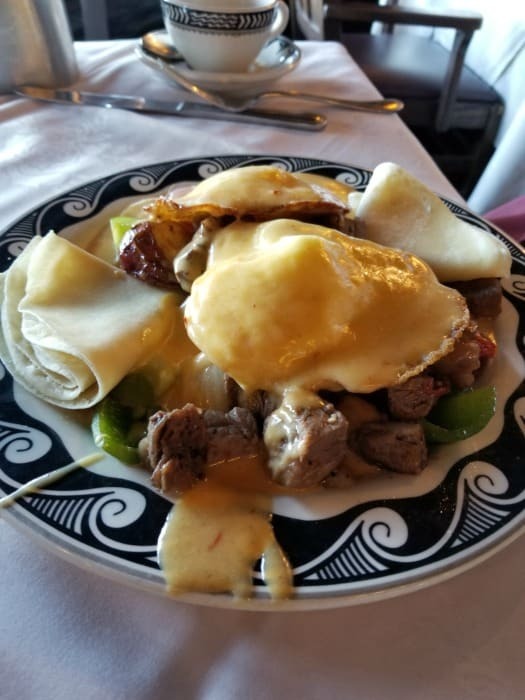 We enjoyed our breakfast so much at the El Tovar that we went back a second time. The view over the Grand Canyon from the El Tovar is honestly unbelievable. Please be prepared that there are only 4 maybe 8 tables that are right next to the window. Don’t worry even if you are seated back a few rows the view is still unbelievable. 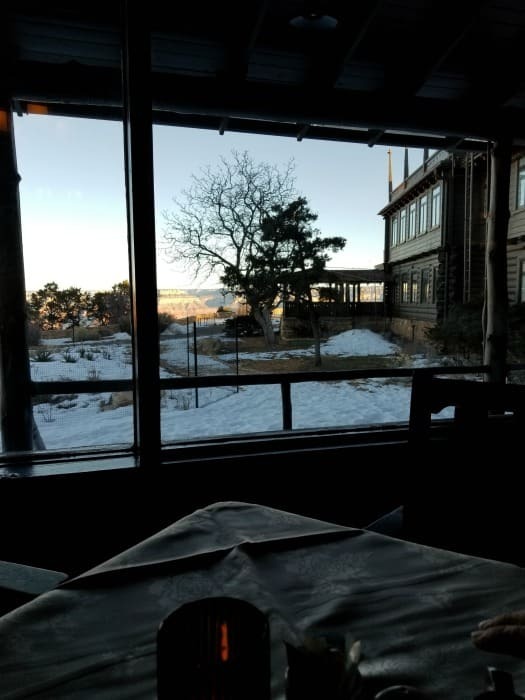 We heard multiple people complaining that they wanted to sit up front and the staff tried their best to get everyone a close seat but there are only so many tables near the window. You can ask at the hostess stand and let them know you are willing to wait if sitting right next to the window is something you have to do. 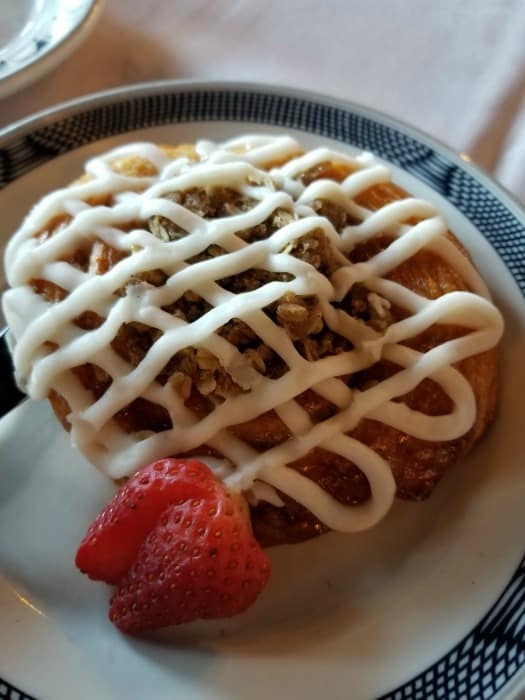 Make sure and order the cinnamon roll and ask for it to be warmed up. Oh my goodness they are so delicious. The pastry horn filled with fresh cream and fresh fruit is also amazing. Honestly, everything we tried was absolutely delicious. 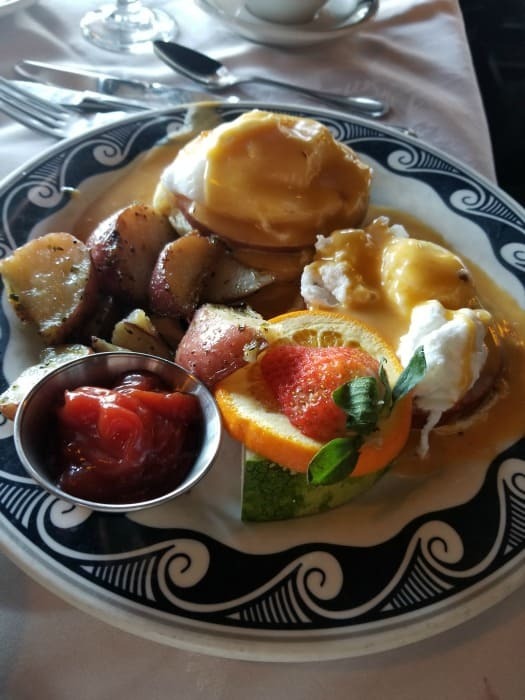 I tried the poached eggs benedict and the El Tovar Signature Prime Rib Hash and they were both amazing. I am not sure which one I enjoyed the most. The oatmeal was also great served with fresh fruit. 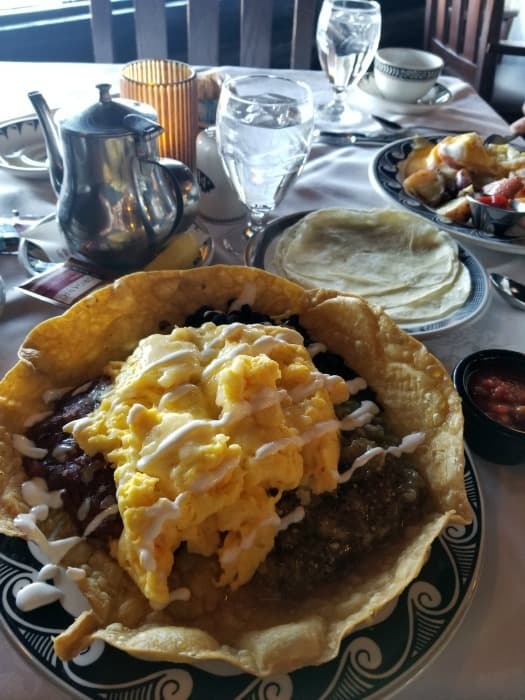 My wife fell in love with the Sonoran Style Eggs served in a tortilla bowl. One of the best things about eating at the El Tovar is they are willing to work with your dietary restrictions and don’t blink an eye when you ask. My wife has been a vegetarian for over twenty years and was able to easily adapt the menu to fit her tastes. The restaurant can also adapt for gluten-free and vegan diets. El Tovar Breakfast Menu Highlights not to miss! Breakfast – 7:00 a.m. to 10:30 a.m. Lunch – 11:30 a.m. to 2:00 p.m.
Dinner – 5:00 p.m. to 9:00 p.m. Lounge – 11:30 a.m. to 9:30 p.m. The cocktail lounge is located in the El Tovar lobby and offers great cocktails and wine along with small plates to snack on. You can enjoy your drinks on the patio with a view of the Grand Canyon that is hard to believe. 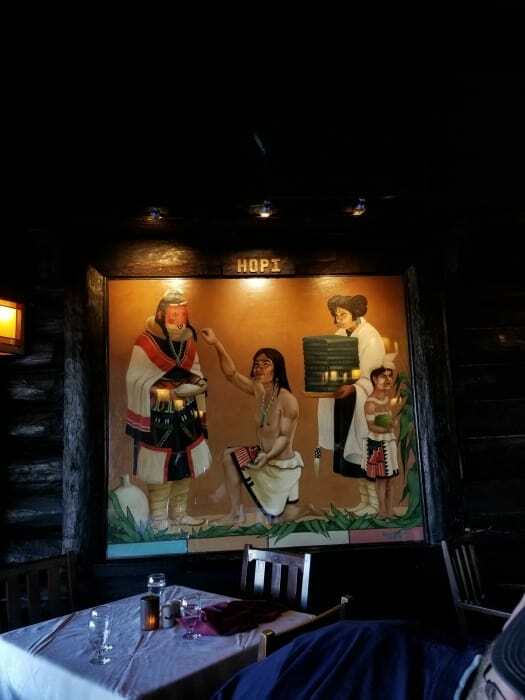 Check out all of the Grand Canyon South Rim Restaurants for ideas on where else to dine during your trip to the Grand Canyon. Hopi-Praying to Hahay ‘ mana, Mother of all Kachina: the Central figure is beseeching Ha-hai-mana for a good harvest; Kachina on the left will carry the message to the gods. A girl offers Piki bread to Kachina and the boy is holding a melon, which symbolizes good crops. Water jug holds holy water to bless the people. Apache-Sun Rise Dance: The two young girls have just reached puberty and will dance all night. During this puberty dance, the four mountain spirit dancers on the right will put scars on the wrists of the girls, showing that they are now mature and ready for marriage. Two figures on the left are a drummer and a singer. 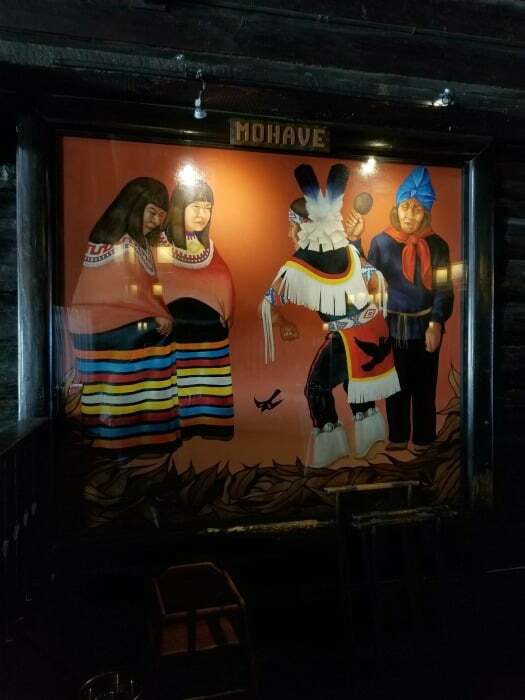 Mohave-Bird Dance or Harvest Dance: Bird dancer and singer are shown on the right. The two girls on the left are giving thanks for a good harvest, while the birds clean the fields to show the gods that there has been no waste. Navajo-Feather Dance: The Navajo Kachina ‘Yah-bits-hi, is depicted as an old man in a mask on the right. The singer in the center of the picture has strings attached to his drumsticks so the feathers dance in time to his drumming. The two kneeling figures are making the offering while a spectator, on the left, looks on. There are two gift shops in the main lobby of the El Tovar. The small gift shop has some snacks, a few books, newspapers, and a few souvenirs. 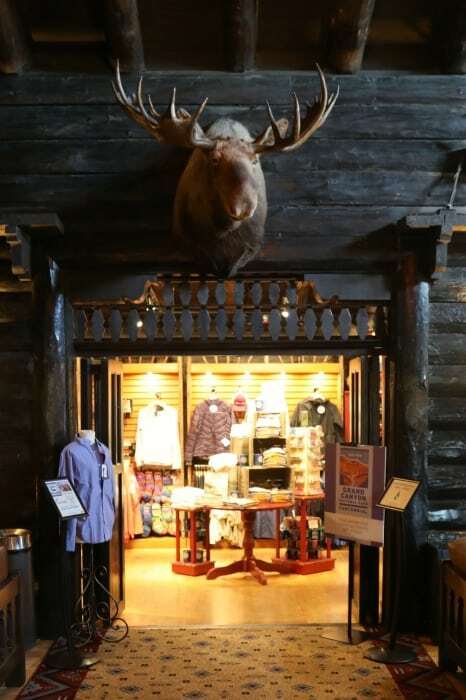 Across the lobby, there is a larger gift shop that has Pendelton Products based on the Grand Canyon, jewelry, Grand Canyon Wine, the dishes used in the main dining room, and so much more! 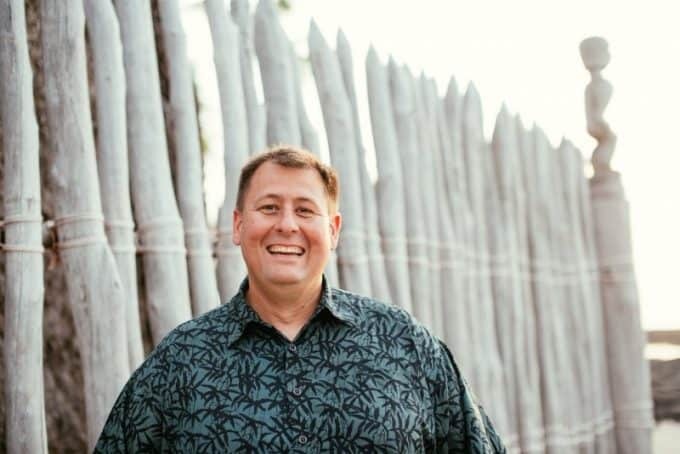 Parking – The parking lot is shared with the Hopi House and the Verkamp’s Visitor Center/ Store! Be prepared and give yourself time to have to loop around the parking lot a few times to find a spot. There is parking along the road but you will need to walk up the hill to get to the El Tovar. Check out all of our Grand Canyon National Park articles for additional information and great tips on planning an epic vacation to this beautiful Arizona National Park!